Many of the pathogens considered ‘emerging’ may have been around for decades, but with new routes of exposure and increased susceptibility they have found new opportunities to reproduce. Microbes continue to surprise (and maybe even outsmart) us with regard to their continued ability to change, adapt and wreak havoc on public health. Technically, a pathogen is considered emerging, or reemerging, if the incidence in humans has increased within the past 20 years or if increased incidence is suspected to occur in the future. New microbial insults seemingly appear overnight, while others follow somewhat predictable patterns of emergence. A range of factors contribute to the appearance of a new pathogen. For example, a pathogen may be previously unrecognized, undetectable or undiagnosed but prevalent in the community for some time; a pathogen may have always been present but harmful only to a specific group of individuals, such as the immunocompromised, or transmitted by a new exposure route; climate changes or a change in the environment may impact pathogen survival or transmission; or a pathogen may truly be a newly evolved genetic sequence, never before present. It is difficult to predict where new health threats will emerge. Common ailments such as ulcers and some cases of diabetes and heart disease have recently been linked to microbial agents. Detection methods are continually improving for better isolation and diagnosis of microbes and their associative illnesses, but efficient and reliable cultural methods have yet to be developed for some of the most common microbial health threats. Changes in lifestyles and cultures play a role in the emergence of new pathogens. For example, compared to 20 years ago, more children are in group day-care environments and more people are traveling nationally and internationally, contributing to an increase in pathogen exposures in new populations. Today, more than 20 percent of our population is considered immuno-compromised, including HIV, organ transplant and chemotherapy patients. One study found that up to 85 percent of Cryptosporidium infections acquired by AIDS patients were from drinking tap water.1 The susceptibility of these growing populations has led to an increased incidence and awareness of microbial infections and their subsequent consequences. In addition to knowing where to look for pathogens, we must know how to look for them. The advent of molecular-based detection methods has opened new doors toward the understanding of emerging microbes. Molecular methods enable us to characterize genetic variations in the same organism. These variations can lead to increased virulence in a pathogen where characteristics such as growth temperatures, heat stability, toxin production, resistance mechanisms, etc. essentially owe to a brand new organism. The waterborne norovirus, for example, consists of numerous, genetically distinct strains, much like the common cold and influenza viruses. Such strain variation can complicate the efficacy of natural immunity and targeted medical interventions (such as vaccines). We now know that noroviruses are a primary cause of human infections in the U.S., including a significant portion of waterborne outbreaks where a causative agent was previously unrecognized. With continued improvements in methods for monitoring and identifying pathogens transmitted in the environment, emerging disease can be better identified both on an epidemic and endemic level. Waterborne disease is generally recognized as being significantly underreported and seldom diagnosed. Thus, the true impact of microbial contaminants in water is difficult to assess. Endemic (low baseline level) waterborne disease is thought to be highly prevalent in the U.S. population. Based on extrapolation from existing databases, researchers estimate that seven million people become ill and more than 1,000 die each year from disease-causing microbes in drinking water in the U. S. alone.2 During 2001-2002, the Centers for Disease Control and Prevention (CDC) reported only 31 drinking water outbreaks resulting in 1,020 cases of illness and seven deaths. The agents significant for endemic infections may be different than those targeted from outbreak data. Genetic mutations are common in nature; however, most have no notable effect on the organism or its virulence properties. Microbial sequences may mutate due to either an outside stress (i.e., exposure to ultraviolet light) or the inherent inefficiency in the nucleic acid replication process of the organism. In either case, the genetic sequence of the organism is altered. Another common event is the exchange of genetic information—such events have been purposefully orchestrated by scientists to enhance positive attributes of microbes. For example, the properties of a fast-growing bacteria may be genetically combined with an organism capable of degrading toxic pollutants to produce an ideal organism for use in bioremediation practices. In nature, bacteria are constantly exchanging genetic information, providing an opportunity for the combination of a variety of virulence factors that may collectively create a newly emerging pathogen. Genetic sequencing data indicates that the Escherichia species and Salmonella species diverged from a common ancestor about 120 to 160 million years ago, around the time of the origin of mammals. Shigella species are thought to have arisen from E. coli about 80 million years ago, around the time of the origin of the primate. Nonpathogenic E. coli is part of the normal flora of the intestinal tract of humans and other warm-blooded animals and is generally harmless. Over the course of evolutionary history, E. coli appears to have undergone mutation events and in addition, acquired virulence genes from other bacteria, resulting in a potentially severe and even life-threatening infectious agent (E. coli O157:H7) that rapidly emerged in the 1980s. In an effort to thwart the next potential emerging hazard, in 1996 the Safe Drinking Water Act was amended requiring that the U.S. EPA establish a list of contaminants of potential public concern that were not currently regulated. 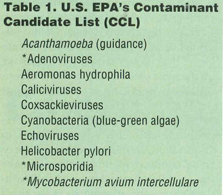 This list is known as the Drinking Water Contaminant Candidate List (CCL) (Federal Register, March 2, 1998, 63 FR 10273) and is meant to identify priority contaminants for drinking water research, occurrence monitoring and guidance development, including health advisories. Of the initial list of 10 microbes, research to date shows that those marked with asterisks are the most problematic in terms of conventional drinking water treatment (Table 1). Although microsporidia is inactivated by UV light, it is relatively resistant to chlorine. Also resistant to chlorination, certain mycobacteria are of great concern in hospital outbreaks among immunocompromised individuals. Conversely, adenovirus is sensitive to chlorine but the most resistant waterborne pathogen to UV light. One is cautioned that as new treatment solutions are applied to address previous issues, new issues will undoubtedly be created. In the environment, microbes are continually evolving, mutating and sharing genetic information. Strains are known to change within a single host, complicating efforts to determine the relatedness of specific organisms over geographical distributions. While the evolution of new pathogens are a definite concern, the increased virulence of well known pathogens is also unsettling. Recent acquisition of antibiotic resistance characteristics have complicated treatment efforts for some common pathogens, now considered emerging, or reemerging. Some strains of bacteria that cause tuberculosis are resistant to the three major antibiotic treatments, meaning that an infection with one of these strains may be virtually untreatable, as was the case before the advent of antibiotics. As with most pathogens, the best way to combat new microbes is to avoid initial exposure. Since the exposure routes are common sources such as food, water and direct human contact, it is important to follow precautionary guidelines for safe food handling, water treatment and good personal hygiene. Waterborne disease microbes promise to continue emerging as we recognize their presence in new environments. Nearly half of drinking water related outbreaks are associated with small, noncommunity water systems or private wells, not currently regulated by federal agencies. Groundwater systems are now known to be vulnerable to many of the same pathogens that surface water hosts; however, there are far less treatment requirements for underground water sources. Evidence is emerging that Naegleria, a highly fatal amoebic pathogen, is commonly present in tap water sources, but with few incidences of recognized disease. Evaluating the risk of exposure to this pathogen is an important next step in disease prevention. Improved or added treatment of source water supplies is one avenue for control but maintaining the water quality throughout the distribution system is an added challenge that is best combated at the point of use. Aragon et al. 2003. Endemic cryptosporidiosis and exposure to municipal tap water in persons with acquired immunodeficiency syndrome (AIDS): a case-control study. BioMedical Central Public Health 3:2. Morris and Levin. 1995. Estimating the incidence of waterborne infectious disease related to drinking water in the United States. In Reichard, et al., eds. Assessing and managing health risks from drinking water contamination: Approaches and applications. International Association of Hydrological Sciences Press. Great Britain. Park et al. 2001. Helicobacter sp recovered from drinking water biofilm sampled from a water distribution system. Water Research. 35: 1624-1626. Aboytes et al. 2004. Detection of infectious Cryptosporidium in filtered drinking water. Journal AWWA 96:88-98.